Thinking about taking a day trip during your holiday in Spain ? If you are staying on the Costa del Sol in Spain for your holiday, then why not think about taking a day trip somewhere ? There are plenty of things to do and see on the Costa del Sol and we are pleased to offer you the following days out - all of which you can easily book directly on-line now with a credit card. You have our full back-up for help and advice if needed. Just click on any of the trips listed below to find out more information or to make your booking. Your booking vouchers are both emailed and also sent to you by text message. We collect from Many pickup places between Mijas Costa, Marbella, San Pedro, Estepona, and the Casares Costa. We can also offer specially tailored days out for those who have their own ideas of what they would like to do but maybe have no transport. Just fill in the enquiry form below and let us know what you would like to do and we will see how we can help you. If you need some help with trying decide then please do not hesitate to contact us. For the Tour of Ronda you are collected by coach from collection points along the A7/N340 and Golden Mile and taken to Algeciras, you then board the mountain train which will take you to Ronda following a single-track line which was built over 100 years ago. This famous train route offers spectacular views of the mountains and forests and these incredible sites and can only be seen in this way. You will pass through many pretty Victorian stations on the journey. Once you arrive in Ronda you can take the time to go exploring this pretty Moorish town. You will see the 18th century bridge across the El Tajo Gorge and maybe take a visit to the bull ring which is the oldest in Spain. There is plenty to see in the pretty town of Ronda. Yyou then take the coach back to your pickup point along the scenic Ronda road back to the coast. (Train tickets are included in the price). Note that the Monday Trip only runs during the busier Spring to Autumn months and is aimed more to Germans tourists as the Monday tour is in both English and German,. 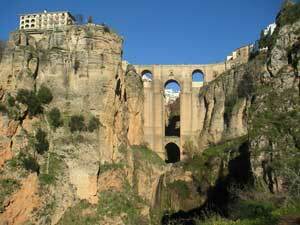 FOR MORE INFORMATION ABOUT THE DAY TRIP TO RONDA CLICK HERE.. Your day trip to Granada takes you inland, towards the impressive Sierra Nevada mountain range. You will first arrive in Granada city where you will have time to visit the Cathedral and explore the Moroccan shops and bazaars. 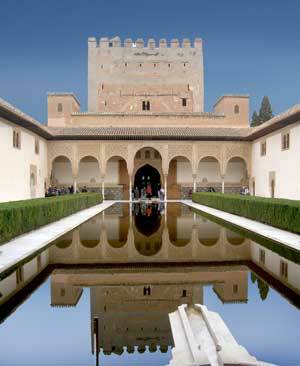 After this, you will be taken to the amazing Alhambra palace - the most visited monument in Spain – to enjoy your official guided tour around the palace. The trip also includes the beautiful Generalife gardens. That the Alhambra Palace and its Generalife Gardens span a large area and there is plenty of walking involved. We need to purchase your non-refundable admittance tickets to the Alhambra Palace at least the day before so the deposit we require to secure your place on the tour includes a non-refundable 20 Euros. Lunch can be arranged for an additional 12 Euros - if you would like this then just request this on the booking form. FOR INFORMATION ABOUT THE DAY TRIP TO ALHAMBRA PALACE AND GRANADA CITY CLICK HERE..
Fuengirola zoo is well worth a visit and is popular with both adults and children. The zoo was recently modernised and provides excellent purpose built areas where the animals are left to roam free without cages or bars. The zoo is made up of many easy walkways that meander through the animal enclosures. This is one of the world's finest town zoos with state of the art facilities. 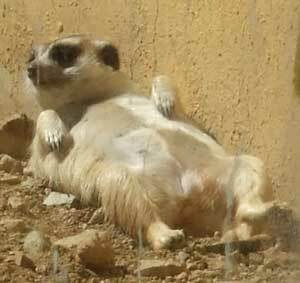 The zoo also participates in breeding programmes for 35 European endangered species. There are various free daily shows and also a free guided tour of the lemur den every 30 minutes. There are two good restaurants where you can stop for food and refreshments. After the zoo, you return to the coach and go on to the famous white village of Mijas. Here you are free to explore the pretty narrow streets which are crammed with local craft shops and restaurants tucked away. You may like to take one of the donkey taxis around the town or walk along the gardens which provide spectacular views out to sea. FOR INFORMATION ABOUT THE DAY TRIP TO FUENGIROLA ZOO AND MIJAS WHITE VILLAGE CLICK HERE..
For the Fuengirola day trip you are collected along the coast and taken for a visit to Fuengirola to enjoy looking around this popular costal town and also to the market which is one of the largest on the Costa del Sol. There are plenty of shops and stalls and you will also have time to walk along the promenade. Re-joining the coach you will travel into the famous white mountain village of Mijas, one of the most renowned Andalucía “pueblos”. Here you will have plenty of time to explore the pretty walks, enjoy the spectacular views and then to go shopping in the traditional narrow streets. You could also take a trip on one of the donkey taxis. You then return to the coach for your trip back to your starting point. FOR INFORMATION ABOUT THE DAY TRIP TO FUENGIROLA MARKET AND MIJAS WHITE VILLAGE CLICK HERE..
Seville is the famous capital of Andalucía. It is an ancient large city full of charm and historical places to visit. When the Seville tour arrives, we take a short tour of the city of Seville, including a visit to La Giralda, the majestic Plaza de España and the symbol of Seville. Then to the famous Cathedral, which is one of the largest in the world (your entrance fee included). You will then have free time to explore the city yourself and perhaps take a river cruise or ride in a horse-drawn carriage. 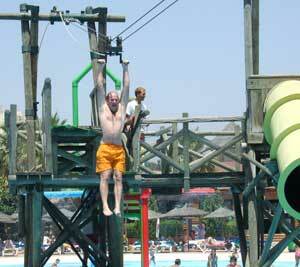 FOR INFORMATION ABOUT THE DAY TRIP TO SEVILLE CLICK HERE..
Water parks are always a great fun day out for both adults and children alike. There are cafes and bars available or why not take your own packed lunch! Cloakrooms, changing rooms, showers and safety deposit boxes are available. Sun beds can be hired for the day trip to the water park. All you need to enjoy a really fun day out. DON'T FORGET TO BRING SUN CREAM! FOR INFORMATION ABOUT THE DAY TRIP TO THE WATER PARK CLICK HERE..
For the day trip to Gibraltar, we provide you with return transport by coach to Gibraltar – “The Rock”. We will drop you off in the shopping area of Gibraltar – Main Street - and you are left alone to do your own thing. You will be collected again at the end of the day for your return back to your collection point (please remember that passports are required to enter Gibraltar). There are plenty of duty free shops selling electrical items and souvenirs to visit in the high street. The beautiful botanical gardens are also well worth a visit and are near to the cable car, which you can take up the rock. The marina is also home to plenty of modern restaurants and bars and is well worth strolling around. FOR INFORMATION ABOUT THE SHOPPING TRIP TO GIBRALTAR CLICK HERE..
You will be collected and taken to the rock of Gibraltar. From here, you will transfer to a mini coach and be taken on a wonderful guided tour with plenty of informative stories told by your guide. The price includes admission to all the main attractions such as St. Michael's Cave (with its impressive galleries, stalactites and stalagmites), the Siege tunnels (where a whole village was built inside the rock!) 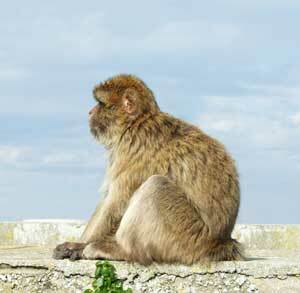 plus the Upper Rock where you can see the world-famous Barbary Apes. The tour finishes near Main Street where you will be left with some time for shopping before returning back to Spain. Please don’t forget your passport for entry to Gibraltar..
FOR INFORMATION ABOUT THE GIBRALTAR ROCK TOUR CLICK HERE.. 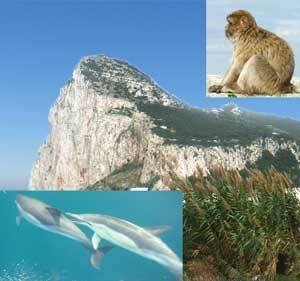 The coast of Gibraltar is the best place to see the Dolphins due to its position where two oceans meet. Join us on board 'DOLPHIN WORLD' to enjoy watching the dolphins swimming alongside the boat in the bay of Algeciras. If you’re quick, you may also catch sight of a few flying fish along the way! The excellent on-board commentary makes this a very special adventure for everyone. 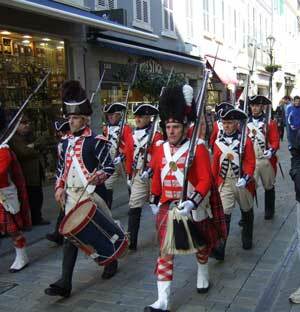 Afterwards, you will also have time for duty free shopping or exploring more of Gibraltar. Please don’t forget your passport for entry to Gibraltar. 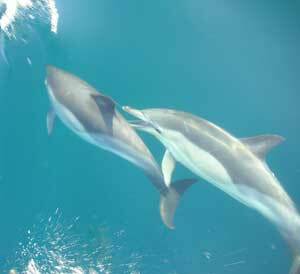 FOR INFORMATION ABOUT THE GIBRALTAR DOLPHIN BOAT TRIP CLICK HERE.. This allows you to do both the Rock tour and the Dolphin boat trip on the same day and also gives you a little bit of shopping time. FOR INFORMATION ABOUT THE GIBRALTAR ROCK TOUR WITH DOLPHIN BOAT TRIP CLICK HERE..
We start the trip by firstly taking you to the small town of El Palo, where a typical Andalucian breakfast is served. After this, we follow the coast road to the famous caves of Nerja - Spain’s third most visited site. 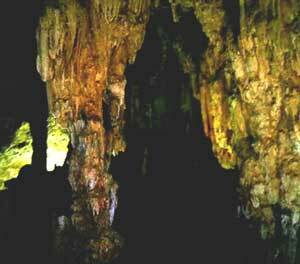 The caves are very impressive and have the 32 meter high ‘Cataclysmic Hall’. The cave has been inhabited for over 20,000 years, and many of the artifacts can be seen from its history, including prehistoric paintings which are kept in the museum. After the cave, we visit the town of Nerja, where you will have free time to explore the sites or just amble amongst the shops and bars of this very interesting town. FOR INFORMATION ABOUT THE DAY TRIP TO NERJA CLICK HERE.. The El Chorro tour begins by driving inland to an old Olive Mill where you will be given a fully guided tour and, when in season, the full olive oil production process will be shown. Light refreshments are provided. Afterwards, we visit an authentic citrus fruit farm of around 17,000 trees, where, if in season, we can sample fresh fruit, straight from the tree. 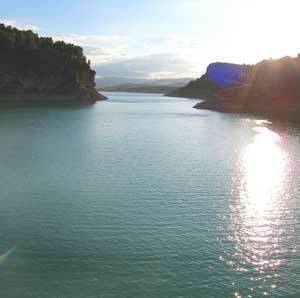 Afterwards, a tour of the spectacular Spanish Lake District follows - passing by the dramatic El Chorro Gorge. We stop for lunch before returning to the coast. FOR INFORMATION ABOUT THE DAY TRIP TO EL CHORRO AND THE SPANISH LAKES CLICK HERE..
We start the Cordoba day tour by travelling through the beautiful mountain scenery, olive groves and the wine-growing regions and arrive in Cordoba late morning. Cordoba is a beautiful wealthy city and is one of the most elegant in all of Andalucía. 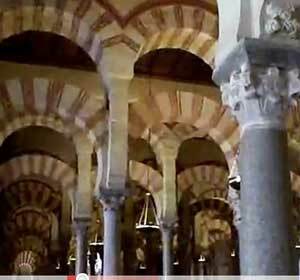 Cordoba is famous for its Mesquita - the only Mosque-Cathedral in the world. 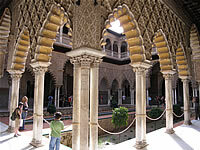 The tour includes entrance to the Mesquita and a chance to look around its fabulous interior. You will have plenty of free time to enjoy this lovely city, with its beautiful fountains, Alcazar gardens, Roman Baths and the famous Jewish Quarter before returning to the coach for the journey back to the coast. FOR INFORMATION ABOUT THE DAY TRIP TO CORDOBA CLICK HERE..
You are collected by coach and taken to Tarifa where you will catch the fast ferry to North Africa (about 40 minutes crossing time). From here you will pass through the neighborhood of the Royalty and the wealthy Moroccans and leave the coach for a tour of the caves of Hercules. Your tour guide will provide you with a good explanation of the history of Tangiers and why it is a multi-national place together with information about its culture and religion. Afterwards, you will head back to Tangiers city and go for a traditional Moroccan lunch during which traditional music and dancing will take place. After lunch, you will be escorted through the Medina (the old part of the town) and the Souk (shops and market area) and also through the Kasbah (fortress). If time permits, you will visit an herbalist and be given some time for shopping and refreshments before returning to the fast ferry back to Spain and onward by coach to your pickup point. Please remember your passport! FOR MORE INFORMATION ABOUT THE DAY TRIP TO TANGIERS CLICK HERE.. If you would like to request any specific trips or tours whilst in Spain then please provide us with the details below and we will get back to you shortly.